Lorin Maazel leads the Philharmonia Orchestra and a star-studded ensemble of performers in Mahler’s first three Symphonies. This is the first release in a series that will encompass all nine of Mahler’s Symphonies—each recorded live at London’s Royal Festival Hall. Mahler suggested that his First Symphony and the Lieder eines fahrenden Gesellen arose from similar situations and the degree of overlap between them is certainly striking. For a start, the symphony takes some of its material from the song cycle—the main theme of the first movement is derived from the carefree walking song Ging heut’ Morgen über’s Feld, and the dream vision at the end of the cycle reappears in the third movement of the symphony. But just as the songs were composed in the wake of Mahler’s failed relationship with Johanna Richter, so the symphony was completed, at fever pitch in the spring of 1888, following the ending of his affair with Marion von Weber (wife of the composer’s grandson). In fact, it seems likely that the beginnings of the symphony go back to Mahler’s time in Kassel, and thus overlap with the composition of the songs. In its original form it had five movements, including an Andante (Blumine) composed in 1884 as part of Mahler’s incidental music for the verse play Der Trompeter von Säkkingen. Later, after he had removed the movement, clearly the music to a love scene, Mahler referred to it as his hero’s ‘blunder of youth’. The première, in November 1889, was conducted by the composer in Budapest where Mahler had recently become Artistic Director to the Royal Hungarian Opera. Clearly undecided as to what kind of work he had written, Mahler presented the work as a ‘Symphonic Poem in Two Parts’, thus aligning himself with the modernity of Richard Strauss rather than the more conservative tradition of Brahms. But critics and public alike were perplexed by the abrupt changes of mood, especially between the spring-like atmosphere of the first three movements (Part I) and then the sudden reversal of character in Part II, with its funeral march and highly dramatic Finale. Not for the last time, there was a demand for the composer to provide a more helpful commentary to his music. The work languished for four years without a further performance, until 1893 when a revised version was performed in Hamburg, but Mahler’s ambivalence about the nature of his work was still unresolved. He referred to it both as a ‘Tone Poem in Symphonic Form’ and as a ‘Symphony’. Stung by the critics’ comments at the première, he now provided programmatic titles for each movement and the whole work was titled ‘Titan’, apparently in reference to a novel by Jean-Paul Richter. Part 1 (From the Days of Youth: Flower, Fruit and Thorn pieces) consisted of three movements: 1. Spring without end; 2. Blumine; 3. Under full sail. Part II (Commedia humana) was made up of 4. The Huntsman’s Funeral Procession, a Death March in Callot’s Manner; and 5. ‘Dall’ Inferno al Paradiso’. By the time of the work’s fourth performance, in Berlin in 1896, Mahler had removed the Blumine movement altogether, and presented the work simply as a ‘Symphony in D major for full orchestra’, but his anxiety about explanatory programmes persisted. For the Viennese première in 1900, Mahler ensured that his own comments on the movements were fed to a leading newspaper by his friend and confidante, Natalie Bauer-Lechner. Even so, critics reacted badly to the sense that this was indeed programmatic music, but with the programme withdrawn. One called it ‘a satire of the symphony’ while others dubbed it, in comparison with Beethoven’s Eroica, a sinfonia ironica. One listener recorded in her diary: ‘An astonishing jumble of styles—and an ear-splitting, nerve-shattering din. I had never heard anything like it. It was exhilarating, but no less irritating.’ That was the impression of the young Alma Schindler; she became Mahler’s wife less than four months later. If a symphony should contain the whole world, as Mahler was famously to suggest, it is fitting that his First Symphony begins as if it were the beginning of the world. The slow introduction is marked Wie ein Naturlaut (like a sound of nature) and is one of Mahler’s most sustained landscape evocations—a musical depiction of dawn in which the distant sound of horns and military fanfares overlap with bird calls against a background haze of string harmonics. Mahler described it as the awakening of nature out of the long sleep of winter, ushering in ‘spring without end’. What follows is an exuberant Allegro, based on the bright energy of the second Gesellen song. But the divided world of the song cycle is not left behind; the sunny Allegro is cut short by a return to the slow introduction, and the central development section sees yet another return to this mysterious landscape. The lonely wanderer can still be heard in the mournful dialogue between the cellos and a forest bird (solo flute). In Mahler’s music the beauty of nature is often the site of human loneliness but also the threshold to new life. The return to the Allegro is marked by a quiet horn call; by the end of the movement it is given fortissimo in great youthful whoops. The second movement opens with an energetic country dance, derived from one of Mahler’s earliest songs (Maitanz in Grünen, or Hans und Grete). Mahler’s real fondness for the heavy-footed pleasure of this Ländler is clear; to the traditional folk material he adds a new contrasting section, more chromatic and stormy, which acts as a foil to the return of the rustic simplicity of the opening. This is a staged village scene, not the real thing, and Mahler’s movement is not hard to hear in terms of a scene from an opera—or operetta. The village dance of the outer sections gives way, in the central Trio, to more intimate exchanges—as if the chorus disperses to frame a rather flirtatious and slightly tipsy scene between the soloists. This is based on a slow waltz, characterised as sentimental and wistful by the sighing glissandi in the strings and the constant elasticity of the tempo. The start of the third movement remains shocking even to modern listeners. A timpanist beats out a mechanical rhythm, over which a solo double-bass plays the children’s song, Bruder Martin (Frères Jacques) in a minor key. The macabre effect of playing a nursery song as a funeral march is enhanced by the thin tone of the double-bass—an early example of Mahler’s use of the grotesque. It must have been utterly bewildering to Mahler’s first audience—as if an old tramp had walked out to sing on the stage of the Court Opera. But worse is to come, because the march is later interrupted by what seems like a band of street-corner buskers, the two different musical types grating awkwardly against one another. Into this nightmare, however, is inserted the vision from the end of the Gesellen songs—just another kind of unreality in Mahler’s dreamscape. The title supplied for this movement offers some background to the strange nature of this imaginative world. The Huntsman’s Funeral was a picture by Moritz von Schwind in a popular children’s fairytale book, in which the hunstman’s cortège is formed by the animals of the forest. With the phrase ‘in Callot’s manner’, Mahler signalled his sense of kinship with the weird and distorted tales of another of his favourite authors, ETA Hoffmann. This weird fantasy world is interrupted by the Finale erupting, in Mahler’s words, as a ‘sudden outburst of despair from a deeply wounded heart’. A storm of orchestral violence is unleashed here, completely at odds with the symphony so far. When this eventually subsides into a brooding silence, it is followed by one of Mahler’s most beautifully shaped melodies. The marking for the strings is sehr gesangvoll (very songful), a direction he used when he wanted instruments to imitate the tone of a singer. It appears like a distant vision of a longed-for goal—but firmly in parenthesis. Taken as a whole, the Finale presents a complex narrative of anticipated breakthroughs, interruptions and re-beginnings. A chorale theme in D major suggests that victory may be in reach, before the music collapses back to nothingness and a return to the mysterious state of nature with which the whole symphony began. The mood is more melancholic now—the wandering lad is older and wiser—but the encounter with nature becomes a threshold to eventual victory. As the falling fourths rain down in the repeated horn phrases of the chorale, like the tolling of bells, it is hard not to be swept along by the sense that, in this music, Mahler has made real his vision. If the Gesellen songs were about loss, then the First Symphony is about returning to that earlier loss and making it good. Mahler’s Second Symphony was already begun before his First had received its première. Indeed, the composition in 1888 of a movement in C minor, later to become the first movement of the Second Symphony, seems to have overlapped with the completion of the First. It shares with the Finale of the First the same tone of high drama and desperate heroic struggle, but now played out on a grander, more objective scale. Moreover, there is good evidence to suggest that it had its origins in the same upheavals of Mahler’s life—not least, the ending of his affair with Marion von Weber. By the autumn of 1888, Mahler had decided that this movement was a single-movement symphonic poem, which he called Todtenfeier (Funeral Rites). The scholar Stephen Hefling has shown that the title and the mood are probably derived from the long dramatic poem, Dziady, by the Polish poet, Adam Mickiewicz, translated by Mahler’s close friend, Siegfried Lipiner, early in 1887. And, much later, after the symphonic poem had become the first movement of the Second Symphony, Mahler specifically underlined the overlap between the two works, insisting that in this movement ‘it is the hero of my D major symphony [the First] whom I bear to the grave’. So why, if the huge first movement was already in place by the summer of 1888, did it take Mahler seven years to bring his Second Symphony to completion? The disappointing reception of his First, in 1889, may well have been a factor, and he was certainly preoccupied with forging his career as a conductor (he became Director of the Royal Hungarian Opera in Budapest, 1889, and Principal Conductor at Hamburg Stadttheater in 1891). But with the revision of his First Symphony in 1893, and the promise of a second performance, he seems to have returned to the idea of a second symphony. In the intervening years Mahler was certainly not inactive as a composer. This is the period in which he wrote the majority of his Wunderhorn songs, a first group for voice and piano, and a second group conceived as orchestral songs. And it was through the Wunderhorn settings that Mahler seems to have found his way back to symphonic composition. He spent the summer of 1893 in the small village of Steinbach on the Attersee (one of the beautiful lakes of Austria’s Salzkammergut region). As he turned 33 years old that July, Mahler had written two ‘symphonic poems’ and some songs, but nothing currently designated as a symphony. The day after his birthday, he completed the Wunderhorn song Des Antonius von Padua Fischpredigt and, within eight days, had turned it into the symphonic Scherzo that would become the third movement of the Second Symphony. A few days later he completed his setting of ‘Urlicht’, which would become the fourth movement, and by the end of July he had completed the genial Ländler movement that would become the second (based on two themes sketched back in the summer of 1888). The following year Mahler revised his symphonic poem Todtenfeier as the first movement of his symphony, which was now essentially complete except for its Finale. Mahler’s increasing frustration at being unable to ‘discover’ the elusive conclusion to his symphony was famously broken during a memorial service held for the great Wagnerian conductor, Hans von Bülow, in March 1894. The sound of a boys choir, placed high up in the cathedral, singing a setting of Klopstock’s Resurrection Chorale, mingled with the funeral bells, seems to have crystallised Mahler’s thinking. After conducting a performance of Siegfried’s Funeral Music from Wagner’s Götterdämmerung on the steps of the cathedral, he reportedly hurried home to sketch the ideas for his own Finale. Whatever its personal origins, the first movement of the Second Symphony conveys an overwhelming sense of collective catastrophe. It shares its C minor tonality and dark tone with Siegfried’s Funeral Music and takes from that orchestral interlude something of its slow processional character. It has a Wagnerian scale about it too, not just because of its large orchestral forces but because of the extended timescale with which Mahler works. Great lines of marching figures seem to emerge from out of the distance as far as the eye can see; the writer Rudolf Stephan referred to the Second Symphony as ‘music drama without scenery’ and it is certainly hard not to think of movements like this one in such visual or even filmic terms. 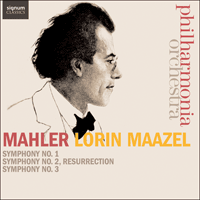 The ferocious opening of the work (more a sudden violent gesture than a musical motif) and the ensuing march figure give way to one of Mahler’s most pleading second themes, but its vision of quiet deliverance is, at this stage, still impossibly distant. The movement as a whole seems defined instead by the snarling returns of the opening and the implacable force of the heavily orchestrated march. Mahler was so concerned about the difference in character between the first movement and the gentle Andante that follows, he noted in the score that the conductor should take a pause of several minutes between the two (most take considerably less). It seems an odd anxiety for a composer whose symphonies generally proceed by extreme oppositions between one movement and the next. Marked Sehr gemächlich (Very leisurely), this wistful dance movement is certainly a world away from the stark opening movement. Its echo of Schubert underlines the sense that Mahler’s music here is an act of nostalgia, a recollected moment of earlier happiness from the life of his symphonic hero, as Mahler was to characterise it later. If Schubert is evoked by the opening dance, the contrasting section that follows is closer to the fairy music of Mendelssohn’s A Midsummer Night’s Dream or some of Weber’s evocations of the supernatural. The movement is not without its passing clouds, and distant rumbling on the horizon, but the successive returns of the leisurely Ländler seem progressively removed from reality and the enduring sense of the music is that of an ethereal memory. The Scherzo third movement is an orchestral expansion of Mahler’s setting of the Wunderhorn song Des Antonius von Padua Fischpredigt, which tells of St Anthony’s sermon to the fishes. The satirical thrust of the poem derives from the fact that, although the fish listen patiently to the sermon and find it excellent, they afterwards all revert to their usual bad ways. The orchestration makes this ironic intent clear enough—the running semiquaver figure sometimes spirals out of key, moments highlighted by the E flat clarinet, which Mahler often uses to comic or grotesque effect. This figure, running like a thread throughout the movement, is generally heard as expressive of what Mahler referred to as ‘this ever-moving, never-resting, never comprehensible bustle of existence’. There are moments of impatience with this futile circling as the music is interrupted by unprepared moments of breakthrough, fleeting anticipations of the great apocalypse of the Finale. For a moment, suspended on a higher plateau, with the distant rumblings of earthly music sounding far below, the Scherzo guesses at a different perspective, before the incessant wheels start turning again. If the Scherzo is a picture of an inauthentic chattering world, with no time for the divine, the fourth movement shatters it with quiet, focused intensity. Following directly on from the end of the previous movement, ‘Urlicht’ begins with the exposed sound of the human voice, the female soloist accompanied by the brass, solemnly intoning a chorale. The humour, ironic play and loquacious repetition of the previous movement give way, in a single moment, to the simplicity and sincerity of this new presence. In fact, the religious tone is only the first of three distinct ‘voices’ Mahler deploys in this short movement. The sacred opening yields to a folk tone for the start of the second verse describing a meeting with an angel (Mahler’s angelic topic is clearly signalled by the bright sounds of glockenspiel, harp and solo violin). But the tone changes once again: the protagonist of the song will not be turned back from the path, even by an angel: the words ‘I am from God, and will return to God’ are set to a harmonic sequence that draws on an impassioned, operatic mode. And with that, the timeless perspectives of religious and folk music succumb to an urgent sense of the present moment. It is the turning point of the work. This one line might serve as the motto for the entire symphony, and Mahler will return to it, sung by both soloists, as preparation for the climax of the Finale. But that is a long way off. The Finale opens with a kind of musical chaos, a ‘cry of disgust’ that parallels the ‘fanfare of horror’ at the start of the Finale to Beethoven’s Ninth Symphony (the larger parallel of a choral finale naturally caused Mahler some anxiety). It subsides to a startling emptiness in which the sound of distant horn calls mingles with disembodied orchestral sounds. A slow marching chorale begins, interspersed with the anxious motif that Mahler later uses for the line ‘O glaube’ (‘O believe’). ‘The earth quakes, the graves burst open, the dead arise and stream out in endless procession’—Mahler’s programme note hardly sums up the vast march that follows. But all of this is preparation for what will become the threshold upon which the whole symphony is transformed and this, typically of Mahler, comes out of a deep silence and a sense of vast spaciousness. In Mahler’s words: ‘The last trumpet is heard—the trumpets of the Apocalypse ring out: in the eerie silence that follows, we can just catch the distant, barely audible sound of a nightingale, a last tremulous echo of earthly life.’ For this, Mahler produces a bold soundscape that still sounds utterly contemporary. Distant horns are answered by four trumpets placed at different offstage locations, on the right and the left, variously closer and further away. These echoing brass sounds, apparently coming from a great distance, mingle with the sound of a bird given by a flute and piccolo from within the orchestra. There are few passages in symphonic music that come close to the way in which Mahler stops time here. Any sense of metre is suspended, and with it any sense of measuring time or forward motion. In a large hall it makes for an astonishing scene. The orchestra sits in silence listening to calls from outside the space of the music, and we, the audience, watch and wait for something to arrive, as if from elsewhere. What does arrive is the ‘Resurrection’ chorale, sung by the chorus in such hushed tones one hardly hears it begin. The threshold has been crossed, and the mingling of voices and orchestra expands steadily, wave upon wave, towards the shattering climax of the symphony. One should not be fooled by the force of the closing bars, generated by Mahler’s relatively conventional treatment of the brass and organ. The end of this symphony is neither comfortable nor bombastic. It is not just that the music has been preparing, for over an hour, the arrival at the climactic ‘Sterben werd’ ich, um zu leben’ (‘Die I shall, so as to live’), nor that Mahler has held back the vast power of his combined choral and orchestral forces for this moment. It is that, when it arrives, it is not experienced so much as a point of resolution that will subside, but rather as an unending torrent of incandescent intensity. Across a vast span of time and in five very different movements, Mahler’s music has explored the human experience of time—of loss, anticipation, memory, cyclical repetition and, above all, of waiting, straining for the dawn. The ending seems to draw up all of this, and with it the whole of historical and eschatological time and to focus it, urgently and intensely, in this very moment, here and now. It’s all you can do to stand your ground as this wind of fire streams out at you. As he had been with both his First and Second symphonies, Mahler was initially ambivalent about whether the Third was indeed a symphony or a symphonic poem. The early outline sketches from 1895 suggest various programmatic titles for individual movements and for the work as a whole. One such was ‘The Happy Life, a Midsummer Night’s Dream’, though without any intended reference to Shakespeare’s play. Another was ‘Symphony No 3: The Joyful Science. A Summer Morning’s Dream’. The reference here is to Nietzsche’s Die fröhliche Wissenschaft, usually translated as The Gay Science, published in 1882. If there are any links between Mahler’s music and Nietzsche’s book they lie in a shared tone of irreverence rather than any philosophical content. A third possible title was simply ‘Pan: Symphonic Poems’. The reference to the Greek god Pan, the wild god of nature, was explicitly linked in Mahler’s sketches to Dionysus, the god of wine but also of ecstatic ritual. In both cases, Mahler’s reference seems to be to the timeless force of an unrestrained nature, unordered by the rational or moral codes of modern society, and the music to his vast first movement certainly seems to bear this out. Like the Second Symphony, the Third is a mega-symphony, a work with a cosmic ambition to sum up the trajectory of creation itself, in Mahler’s own words ‘a musical poem embracing all stages of development in a step-wise ascent [that] begins with inanimate nature and ascends to the love of God.’ This vast conception has to be understood in the context of an age that was highly attracted to grand, all-encompassing accounts of the natural world. Mahler had a lifelong interest in philosophical and scientific theories and read widely in these areas, but he was also part of a cultural tradition in which artists and musicians expected to take on the great themes of life and death. He had a life-long devotion to the works of Richard Wagner, whose last music drama Parsifal (1882) was, at that time, still performed only at Bayreuth under quasi-religious conditions. Mahler’s Third Symphony thus grows out of an understanding of art as a kind of religious and philosophical quest. That this nature hides within itself everything that is frightful, great, and also lovely (which is exactly what I wanted to express in the entire work, in a sort of evolutionary development)—of course no one ever understands this. It always strikes me as odd that most people, when they speak of ‘nature’, think only of flowers, little birds and woodsy smells. No one knows the god Dionysus, the great Pan. There now! You have a sort of programme … Everywhere and always, it is only the voice of nature! Many commentators, including Mahler’s contemporaries, heard in this work not just the force of nature, but also that of the new politics of a popular and mass society. Richard Strauss likened the great march of the first movement to the experience of a May Day parade in the Prater Park in Vienna. The unison horn call that opens the movements was heard by some as the quotation of a 19th-century student protest song, as used also by Brahms in his Academic Festival Overture. Critics railed against what they saw as the symphony’s vulgar, banal and frivolous elements, perplexed about how to understand the sudden contrasts between the rarified world of symphonic music and tunes and rhythms more usually heard on the street. Was Mahler trying to parody the hallowed genre of the symphony in this way? Often, they concluded that he was. This is an immense movement, conceived on a vast scale—not just in terms of its duration (over 30 minutes for this movement alone) but in its unwieldy form and sheer weight of sound. Few pieces of music evoke such a powerful sense of ‘the world without form’, summoning its materials out of a kind of primeval emptiness. ‘It is eerie’, Mahler commented, ‘how from lifeless matter (I could just as well have named the movement ‘What the Mountains Tell Me’) life gradually breaks forth, developing step-by-step into ever-higher forms of life.’ The opening call, played fortissimo on eight horns in unison, seems to echo into some vast emptiness. A sombre march rhythm begins, the only hint of directed movement, amid low rumblings in the percussion. The emptiness is broken only by unpredictable eruptive gestures, shooting skywards like spouts of molten lava. ‘Some passages of it seem so uncanny to me’, Mahler later commented, ‘that I can hardly recognise them as my own work.’ His representation of elemental origins was, necessarily, also a sounding of the Unconscious. The second movement sees a complete change of voice; in place of massive energy and force we are presented with utter transparency and simplicity. Mahler’s Ländler is marked grazioso, denoting a sense of ease and perhaps even a gentle sentimentality. ‘It is the most carefree music I have ever written’, Mahler said, ‘as carefree as only flowers can be.’ Its tremendous lightness of touch suggests a chamber-orchestra style in which solo orchestral voices often come to the fore. Like many of Mahler’s inner movements, this is a character piece, made up of contrasting sections more like ballet music than the symphonic narratives of Mahler’s outer movements. A sense of dream-like fantasy is never very distant here, more like the world of Mendelssohn’s A Midsummer Night’s Dream than the grand tone of Bruckner or Wagner. ‘The Scherzo, the animal piece, is the most ludicrous and at the same time the most tragic … This piece really sounds as if all nature were making faces and sticking out its tongue. But there is such a horrible, panic-like humour in it that one is overcome with horror rather than laughter.’ Mahler’s sense of horror is perhaps less obvious to the modern listener, who is more likely to hear the charm of this movement. It is derived from one of Mahler’s Wunderhorn songs but, as with the Scherzo of the Second Symphony, turned here into a purely instrumental movement. Der Ablösung im Sommer (The change in summer) is typical of his naïve folk-style. It tells of the ‘change of the guard’ in the forest, from the spring (represented by the cuckoo) to the summer (represented by the nightingale). The symphonic movement takes up some of the simple humour of the song, in which the world of the forest birds and animals takes on a self-sufficient quality. This world, however, is broken into by a distant fanfare signalling the human world. The famous ‘posthorn’ interlude (written for a flügelhorn) is directed to be played ‘as if from a great distance’. It provides a wonderful example of Mahler’s ability to create the haunting effect not only of spatial distance—but also of temporal distance. What starts out as a fanfare, such as one might imagine hearing from a distant posthorn, becomes a more sentimental folk-like melody. It creates a powerful sense of reminiscence—of looking back to a distant time. Mahler’s forest creatures, at first startled by this intrusion, begin to interact with the new voice. Two horns join in, and the rapt string chordal accompaniment is marked to be played ‘as if overhearing’. The fourth movement brings the distant sound of the human world centre-stage as, for the first time in this work, we hear the human voice. An alto soloist delivers a setting of the dark ‘Midnight Song’ from Nietzsche’s Also sprach Zarathustra (Strauss’s tone poem of that title was written at exactly the same time, 1896). It begins in the depths of night, with a deeply mysterious atmosphere created by Mahler’s withholding any familiar sense of musical movement. In its place, we hear only the gentle rocking of the bass instruments, the slow tolling of bells and ‘sounds of nature’, like the haunting screech of a night-bird (in the oboe). Only gradually does the lyrical expression of the voice, joined by solo violin and horn, begin to draw out a sense of yearning movement in the face of the dark silence of nocturnal nature. In the context of Nietzsche’s philosophical fable, this poem has to do with the prophet’s disgust at contemporary man but also acts as an expression of faith in his potential for transformation. This threshold function is exactly how Mahler’s setting of it works within the Third Symphony—as a borderland between one state of consciousness and another, a place where the earthly and the heavenly overlap. 5. What the morning bells tell me The brooding, meditative and deeply solemn tone of Nietzsche’s ‘Midnight Song’ gives way to the light-hearted humorous tone of ‘Es sungen drei Engel’ (‘Three angels were singing’). Mahler’s performance direction is keck (cheeky), and it begins with a boys’ choir imitating the tolling of the bells (‘Bimm Bamm’) before being joined by a women’s choir for the song proper. The original Wunderhorn poem has the title ‘Poor Children’s Begging Song’, and the childlike viewpoint of the song is key to Mahler’s setting here, just as in his setting of Das himmlische Leben (Heavenly Life), originally intended as the seventh movement of the Third Symphony, but which Mahler used as the finale of the Fourth instead. With childlike directness the song tells of the angels’ singing before moving to the idea of sin and forgiveness. Its irreverent tone makes for an unlikely and oblique account of the sinner’s tears of contrition and the promise of the eternal love of God, a divergence between text and setting that was exactly what confounded critics in Mahler’s lifetime. With the Adagio finale, however, Mahler reverts to his most sincere and religious tone. Though this movement is written for instruments alone, Mahler uses his orchestra like a choir. The strings at the beginning are marked sehr ausdrucksvoll gesungen (sung with great expression). The chorale-like texture, the register and movement of the individual parts, all suggest a kind of intense choral singing, and for a while Mahler confines his string parts to the range of singers. The effect, when it comes, of allowing the orchestra to expand beyond the limits of human vocality is all the more powerful for the restrained beginning. This is a sublimated choir, one taken up into supra-human realms by the instruments of the orchestra, and the movement as a whole proceeds in this way, by a succession of expansions rather than by development or narrative. It enlarges itself from within, rising up through a series of ascending plateaux. Undoubtedly, it takes its model from the slow movements of Beethoven; the critic William Ritter was so moved that he claimed it as ‘perhaps the greatest Adagio written since Beethoven’. The other echo that contemporary critics might have heard was Wagner’s Parsifal. The drama of that opera is played out between the diatonic chorale and march-like materials of the Grail knights and a rather tortured chromaticism associated with the idea of desire and longing. Mahler’s Adagio similarly moves between these two types of music, with the calm assurance of the D major hymn alternating with passages of searching and intensely passionate music. Like Parsifal, Mahler’s music finds its affirmative conclusion in a containment of that chromatic pain within the calm assurance of the diatonic—here, a sustained coda in D major. In doing so, it draws together a symphony of unprecedented heterogeneity, which has journeyed from the raw, elemental world of the first movement with the anarchic energy of its storm winds, through the sounds of meadows, forests and night, to the folk-like vision of heaven. The finale’s vision of divine love is given in a unity and purity of tone that would not reappear in Mahler’s music again until the Eighth Symphony a decade later.